With the membership site "Content Paradise", book publishers are being offered a very interesting and promising alternative of publishing their books in the most effective way possible. 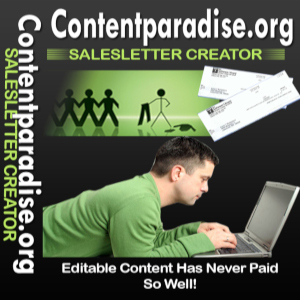 Content Paradise is literally a one of a kind membership site offering extremely high quality re-brandable content from a very wide range of niches written exclusively by professionals! You are also given an entire arsenal of internet marketing tools, such as sales letter templates, sales letter creator software, sales letter ideas, and thorough market analysis for every 4 hand-written and first-rate ebooks and 100 articles that are delivered every month with complete Private Label Rights! Moreover, members are given manuals, guides and bonuses that are not accessible to the public or will ever be, which will give them an almost unfair advantage when it comes to succeed online. Content Paradise is the "Fort Knox" of membership sites!